Join us on an unforgettable adventure! At Pacific Angler, we know that the joy of fishing doesn’t just come from the catch, but from the full experience. Fishing in BC waters offers abundant salmon year round, but also a wild and beautiful journey. With sought-after, experienced guides, and top-of-the-line boats and gear, we offer saltwater fishing at its finest. Here at Pacific Angler, we believe in good old-fashioned customer service. We are here for you from the minute you call to book your trip to the moment you return home with your catch. Our goal at Pacific Angler is to not only help you reel in an abundant catch – but also to blow your expectations out of the water! Our fishing charters begin at the Pacific Boulevard Marina at the Plaza of Nations in False Creek, downtown Vancouver. From there, our guides can take guests to a number of hot spots as far north as Nanaimo and as far south as the mouth of the Fraser. Our charters can take you throughout the Strait of Georgia, as well as up Howe Sound, Bowen Island, or over to the Gulf Islands. With 5 species of salmon available in our lively waters, you can experience fantastic BC salmon fishing year-round! Back at the docks, our guides will clean and fillet your catch, and package it for your trip home. If home isn’t the Vancouver area, we will be glad to connect you with one of our partner companies who can smoke or flash freeze your fish and process for long range transport. At Pacific Angler, we offer individualized service for your best saltwater fishing experience. Whether you and your crew want to spend a half day, full day, or even overnighters chasing your passion, we have the package for you. Here at Pacific Angler, we’re all about customer service. Give us a call and let us know what your dream charter looks like. We’d love to make it happen. Call to book a charter, or to learn more, at (778) 788-8582. Give us a day, we’ll give you the fishing memory of a lifetime! For more details, and to find rates & seasonal information, visit Vancouver Salmon Fishing! 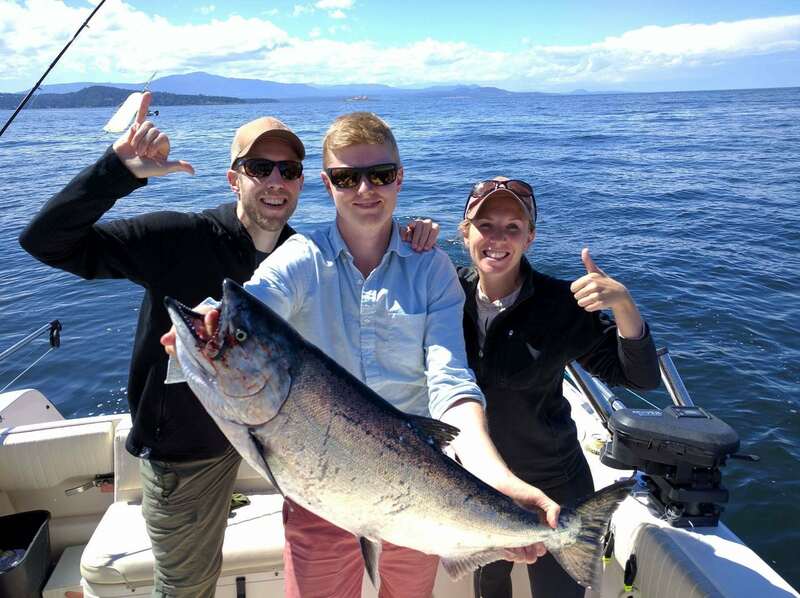 Half days charters are a great way to experience Vancouver from the water. Drop a line within twenty minutes of leaving the dock. Depending on the season and year, you and your crew can have the chance to hook chinook, coho, pinks and sockeye. Seasoned anglers know that time always flies by on the water. If you and your crew are serious about catching fish, a full day charter is for you. The longer hours allow your guide to change fishing spots several times, as well as fish on two tides. On these longer trips, you’ll have time to drop crab and prawn traps in season, or fish for lingcod and rockfish. Spend the day in all of BC’s coastal glory – no limits or fuel surcharge. Our overnight and multi-day saltwater fishing charters are the ultimate way to decompress. You and your crew will be whisked off to a wilderness cabin by float plane or boat. From there, access fantastic fishing hotspots only minutes away. Surround yourself with good friends, lively fishing waters, and let the adventure and tranquility melt the stress away. Pacific Angler’s experienced and friendly guides will make sure everything is taken care of for your trip of a lifetime. Our guides are some of the top BC salmon fishing guides on the coast. At Pacific Angler, our guides are the best in the business – they have appeared in multiple magazines and TV shows. They’re passionate about what they do, and they’ll be putting fish in the boat when most are having a tough day. Safety is a priority for us; all our guides are Transport Canada Certified and have their SVOP, MED A3, ROC-M, Marine First Aid, and are members of the BC Sportfishing Guides Association. With Pacific Angler guides, you’ll experience a safe, exciting and productive day on the water. We want your time on the water with us to be incredible – and that means using top of the line, cutting-edge gear. At Pacific Angler, we take pride in operating a prestigious fleet of Grady-White boats. From 1-2 anglers, up to multi boat corporate events, we have the right boats for your ideal fishing adventure. The easy ride of a Grady-White with premium Yamaha power will get you to the fishing grounds quickly and comfortably. Our 4-stroke motors are extremely quiet, with no fumes, so you can fish in comfort. Our Grady-Whites feature large cabins, spacious deck areas—specifically designed for fishing with multiple anglers—as well as ample storage for your gear. When it comes to tackle, our standards are high. We fish with the best and spare no expense on our boats, and the tackle that we outfit them with. Each boat is expertly outfitted with top-of-the-line angling equipment such as Abel mooching reels, Sage Rods, Scotty downriggers and O’Ki Tackle.